That’s me shooting by in a cloud of chaos. Bit busy here, but just time to say ooooooh! I was one of the winners in the Craftzine aprons competition! How fabulous, thanks Craftzine! There are some great aprons in this, including lots of ones that were also made with ric-rac for the Tie One On challenge. (back story here) I’m a bit embarrassed by my rubbish photo, only half the apron, scissors in the top corner and look at the state of my studio skirting boards! You can’t remotely tell that it’s a patchwork apron, either. 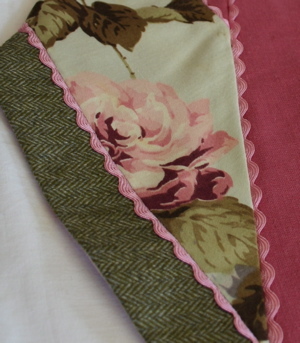 This pattern is going to be in the forthcoming Lark book on aprons, in these pink & green colours. I’ve worn the black apron out a couple of times and its been a big hit. In other news: scooting around getting things together for shop ‘n show this weekend and next, plus preparing some pieces for magazine photoshoot (very cool! ), then some work on the mystery books and a new online shop in development. Never quiet here!